This week we will celebrate Thanksgiving. On behalf of the staff here at St. Martin dePorres Parish, I want to wish all of you a very happy and holy Thanksgiving holiday. In whatever way you spend this holiday, I hope that each of you will enjoy the gift of the day giving thanks to God for all of the many blessings bestowed upon us. As we gather with friends and family this holiday, let us continue to pray for one another. Let us allow the Holy Spirit to take root within us, that we will give thanks not just for this one day during the year, but every single day of our lives. Next Sunday is the Solemnity of Christ the King, which is the last Sunday of the liturgical year. With the first Sunday of Advent, we begin a new liturgical year in the Church. As we prepare to begin this new liturgical year, I invite us to pray for a deeper sense of unity within our parish community. As I mentioned in my homily two weeks ago for the Feast of St. Martin dePorres, I pray for all of you every day! Along with that prayer, I ask the Lord to unite all of us more deeply, and much more closely. Bringing three communities together, with their own history and charism can be a challenge, but I look at the fruits of what could be born, when we all come together as one, building up the body of Christ here in Bedford Stuyvesant. May Christ the Lord give us the strength that we need to go out and proclaim his Good News, in all that we say and in everything that we do. Today, Sunday November 19 we will have our parish Thanksgiving Luncheon, which will take place at St. Peter Claver school immediately after the 11:30AM Mass. All parishioners from each of the three churches are invited to attend this luncheon and it’s completely free! Please be sure to join us for an afternoon of fellowship and Thanksgiving. You have heard much about our 2017 Annual Catholic Appeal. I thank all of you for your generosity, in giving of your time, talent and treasure for the support of St. Martin dePorres Parish. 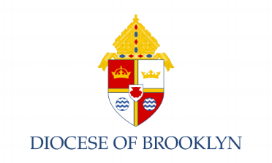 The Annual Catholic Appeal supports the various ministries of the Diocese of Brooklyn along with the continued mission of the parishes. The key to having a successful appeal is full participation. We have 941 registered families who have participated in the ACA in years past. In this year’s appeal, only 71 families have participated. If each family were to participate in this year’s ACA, we would definitely reach our goal. It is also important to know that both Father Kingsley and I participate in the ACA. I have always made it a promise of mine that I would never ask my parishioners to do something that I myself would not do. Next weekend we will have an in pew opportunity for those who have not had an opportunity to participate in this year’s ACA. I cannot thank all of you enough, from the bottom of my heart for your love, support and generosity.